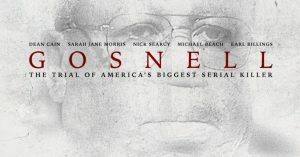 The movie Gosnell: The Trial of America’s Biggest Serial Killer broke into the Top 10 list on its opening weekend despite its limited release and being virtually ignored by film critics and many major media outlets. Despite a media blackout and virtually no coverage outside conservative media circles, the new movie “Gosnell” made the list of top 10 movies across the United States over the weekend. Coming in at the #10 spot, Gosnell came in ahead of other movies with much wider releases — as the film is appearing in just 673 theaters nationwide. . . . But those who are watching the movie are giving in tremendously high ratings. It has a 67% rating at Rotten Tomatoes and 99% of those viewing it said they liked it. The movie follows the 2013 arrest, trial, and conviction of Dr. Kermit Gosnell, an abortionist who murdered babies born alive following botched abortions at his Philadelphia clinic. Aside from being convicted of killing babies born alive—he may have killed thousands of babies this way—Gosnell was convicted of the involuntary manslaughter of a patient. There are good reasons to believe that many more of his patients may have suffered serious complications or even died from his negligence. (Among other things, Gosnell’s penchant for reusing medical instruments without proper sterilization passed sexually transmitted diseases to his patients.) The titular description of him as “America’s Biggest Serial Killer” doesn’t seem like hyperbole. The movie is rated PG-13 for mature content. However, the film itself is not graphic. Ultimately, the media’s decision to ignore the movie Gosnell mirrors its handling of the Gosnell murder investigation and trial. In 2013, major news outlets looked the other way as the Gosnell case unfolded, and in the end many practically had to be shamed into covering it at all. Five years later, it seems nothing has changed; many would rather ignore the Gosnell story altogether. Nevertheless, Gosnell is outperforming many other movies at the box office, and I believe that says something about the American people.